“it is a triumph more glorious, because far more useful to mankind, than was ever won by conqueror on the field of battle. May the Atlantic telegraph, under the blessing of heaven, prove to be a bond of perpetual peace and friendship between the kindred nations, and an instrument destined by Divine Providence to diffuse religion, civilization, liberty, and law throughout the world”. Each letter of the first messages across the Atlantic ocean took over two minutes to send due to bad reception. Compare this to the 84 billion words per second (at the time of writing) over fibre-optic cable, this seems pitifully slow, enough to drive most of us to distraction in our high speed high tech world. But in the 1870’s it was a huge step forward in international communications and one of the first sparks in the information superhighway we take for granted today. The Skelligs coastline from Valentia Island to Ballinskelligs and Waterville played a huge part in this link as the landing site of the first Transatlantic Cables and the site of the first cable stations. Here is the history of the Cable Station in Ballinskelligs and the laying of the cables. While the first commercial cable station was established in Valentia in 1866, competition soon arrived in the form of a British company (Direct United States Cable Company). In 1874 the company established a cable station in Ballinskelligs. 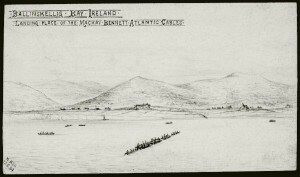 Soon after however the Anglo American Cable Company took a majority shareholding in the British company and a connecting cable was laid from the Ballinskelligs station to the Valentia cable station. Anglo American subsequently leased the line to the telecommunications company Western Union who continued the lease up until 1920. The business was then sold to the British Post Office. The British Post office diverted the European end of the cable to Cornwall in 1923 and the Ballinskelligs cable station was closed. The Cable station buildings became government property soon after their closure and in the 1930’s and 40’s were used as a summer college for Irish language students. They later fell into disrepair and most have now been demolished. While the converted steamer ‘Great Eastern’ had been used to lay the first transatlantic cable in 1872, in the following year an English company built the first special cable-laying ship, the ‘Hooper’. This encouraged William Siemens to build a cable steamship himself, based on this vessel and his own extensive experience, which he christened ‘Faraday’ in honour of his friend Michael Faraday. Its main distinguishing features were the two paddlewheels on the sides which had previously only been seen on American riverboats, and the additional rudder on the bow which made the Faraday extremely manoeuvrable. Superstructures on the deck also made it possible to lay the cable via the bow or the stern. After its completion in spring 1874, the steamer set out at eight o’clock on May 16 on its first transatlantic crossing. Before the main submarine stretch was tackled, the cable between Newfoundland and the United States was laid. The first section went from Halifax in Nova Scotia to Portsmouth in New Hampshire. 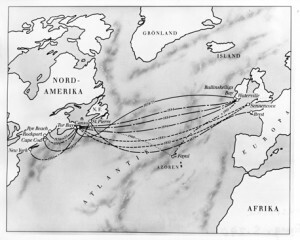 The next section went from Nova Scotia to Newfoundland, though they were prohibited from going on land in Newfoundland due to the monopoly of the Anglo American Telegraph Company. According to the letters that the brothers wrote to one another, the work was completed at the beginning of August. The Faraday returned to the UK, and Carl wrote to Werner and William about the “shore end,” in Torbay in Newfoundland. The spot where the cable was brought ashore, however, is marked today by the Tor Bay Atlantic Provincial Park in Nova Scotia. It was to take another year…. However, the project was not further blessed with good fortune. The Faraday had to fish up and repair the cable several times, until a shortage of coal and stormy weather forced the ‘unhappy cable squadron’ to return to Ireland. There could however be no question of abandoning the cable, since this would have meant a huge loss of prestige for the Direct United States Cable Company and the Siemens brothers. At the end of October the Faraday was already on its way again – and once more had bad luck. Near Newfoundland the cable was lost again in a storm, and this time the ship was damaged as well. Because of the necessary repair work and the permanently bad weather it was no longer possible to think of completing the cable before the end of 1874. 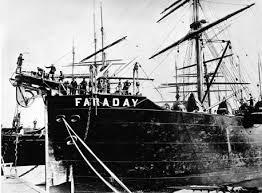 It was not until the beginning of April that the Faraday set sail again, and in June 1875 a link was established between Torbay and Ballinskelligs Bay for the first time. However, the cable was still not operating properly. There were repeated interruptions, which had a very negative effect on both the costs and the mood of those involved. William reported several times to Werner that the Direct United shareholders were demanding that Carl be replaced as director of the project on board the ship.